^ Destroyers – DDG fact file. U.S. Navy, 28 October 2009. ^ 3.0 3.1 More Destroyers Ordered by U.S. Navy. Defense News. 2011年9月26日 [2013年8月8日] （英语）. 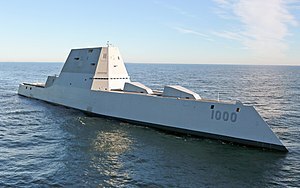 ^ 5.0 5.1 5.2 Navy Names Zumwalt-class Destroyer USS Lyndon B. Johnson. 美國海軍新聞稿. 2012年4月16日 [2013年8月8日] （英语）. ^ 7.0 7.1 7.2 Future USS Michael Monsoor (DDG 1001) Keel Authenticated. 美國海軍新聞稿. 2013年5月23日 [2013年8月8日] （英语）. ^ 8.0 8.1 Upcoming US Navy Ship Commissionings. www.navycommissionings.org. [2017-06-13] （英语）. ^ Commissioning Information – USS MICHAEL MONSOOR (DDG 1001) Commissioning. www.monsoorcommissioning.org. [2018-04-27] （英语）. ^ USS Michael Monsoor Commissioning Ceremony Honors Legacy of Navy SEAL. [2019-01-27] （英语）. ^ 雷神公司: Products & Services: Advanced Gun System (AGS) 互联网档案馆的存檔，存档日期2008-03-19. ^ 雷神公司: Products & Services: Peripheral Vertical Launch System (PVLS) Advanced VLS 互联网档案馆的存檔，存档日期2008-03-19. ^ 雷神公司: Products & Services: Dual Band Radar (DBR) 互联网档案馆的存檔，存档日期2008-03-19. ^ 雷神公司: Products & Services: Integrated Composite Deckhouse & Apertures (IDHA) 互联网档案馆的存檔，存档日期2008-03-19. 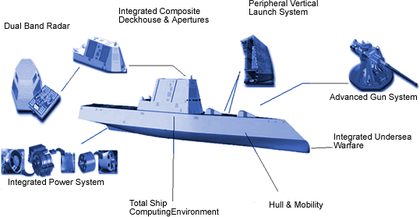 ^ GE Fanuc Embedded Systems Selected By Raytheon For Zumwalt Class Destroyer Program 互联网档案馆的存檔，存档日期2007-10-11. ^ 雷神公司: Products & Services: Integrated Power System (IPS) 互联网档案馆的存檔，存档日期2008-03-19. ^ 雷神公司: Products & Services: Wave Piercing Tumblehome Hull 互联网档案馆的存檔，存档日期2008-03-17. ^ 雷神公司: Products & Services: Autonomic Fire Supression System (AFSS) 互联网档案馆的存檔，存档日期2008-03-19. ^ Taken from the National Defense Authorization Act of 2007, page 68-70 互联网档案馆的存檔，存档日期2006-11-02. ^ 24.0 24.1 Defense News: Will DDG-1000 Destroyers Be Unstable? ^ Taken from the National Defense Authorization Act of 2007, page 194 互联网档案馆的存檔，存档日期2006-11-02. ^ National Defense Authorization Act of 2007 (pdf): Pages 193–194. [2007-03-12].